* Covers the Learning Outcomes and Core Objectives for GOVT 2306 in a way that makes the program SACS-compliant. 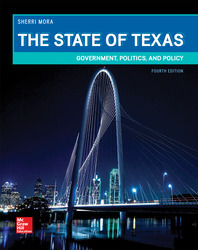 * Incorporates the state Core Objectives and Texas Learning Outcomes. * The Focus On feature presents students with engaging examples of how the Hispanic and Latino individuals, groups, and culture play an important role in Texas political life.